One of the most exciting parts of shopping at a farmers market is meeting and building a relationship with the growers and craftspeople that produce your food! We are delighted that the SMFM is able to host such passionate and dedicated producers, dedicated to bringing you the freshest, locally produced food available. Scroll down to learn more about our vendors! Want to join the SMFM family? We are excited to offer a marketplace where our region's many farmers and food producers can connect with customers. 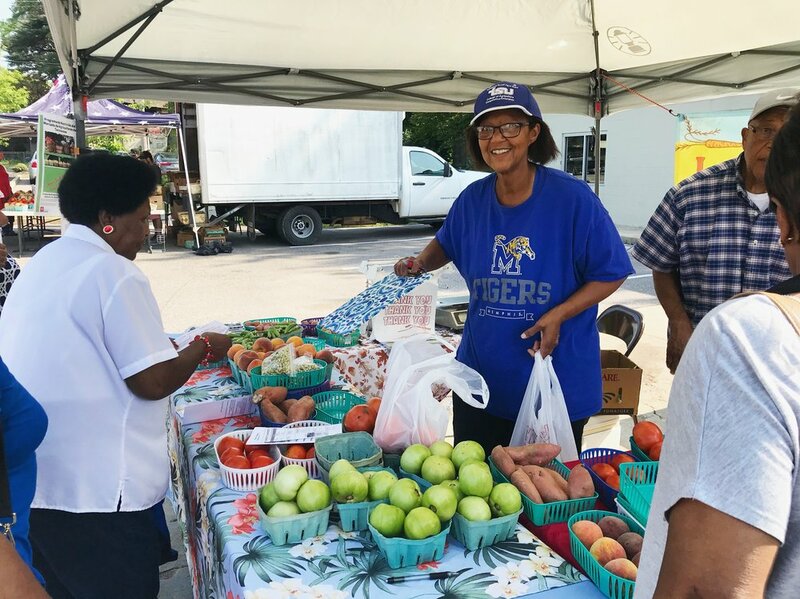 Potential vendors are screened by the South Memphis Farmers Market steering committee with an eye toward providing access to affordable and healthy foods in the South Memphis community. To learn more, head to our “Connect” tab and fill out the market vendor interest form or contact our seasonal market manager by email at brittany.stout@theworkscdc.org . Clark Fruit and Vegetable, a family run farm and business from Haywood County, is new to our vendor line-up this year! Richard Clark and his sons sell various vegetables and fruits including purple hulled peas, onions, tomatoes, plums, peaches, watermelon, okra, and lettuce. You can find Clark Fruit and Vegetable under the bright orange tent on the corner during our Thursday markets! The Produce Tribe joins us from Stanton, TN offering beets, greens, peas, peppers, okra, squash, sweet potatoes, tomatoes, peaches, jams, and jellies! The Produce Tribe is owned by Matthew Robinson. Lockard’s Produce is a Certified Naturally Grown farm in Ripley, Tennessee. Their mission and vision is to re-establish their family’s legacy of naturally grown, fresh and healthy produce. The Lockards' parents and grandparents were farmers during the depression era in Ripley, and they stressed the importance of growing crops so that their families could have food to eat in that time of scarcity. The 21st century generation of the family is keeping up the tradition started by their forefathers. They are growing healthy produce, which will contribute to a healthy lifestyle for future generations! Peach World is run by Wayne and Clara Oswald, who live on a 90-acre farm in Ripley, Tennessee. Wayne was taught how to farm by his father beginning at age seven and has been farming ever since. They began with only peach trees and a few peas and have since expanded to include a variety of over 30 types of produce. However, even with nearly 2500 trees in 25 different varieties, they are still best known for their peaches. Ripley Produce sells a wide range of produce, with tomatoes being their specialty! Whether you are new to the food movement or a seasoned local, Ripley Produce is a great place to start your journey!